Ranging from 215-290hp, Massey Ferguson's new high horsepower models eat up the hectares. Massey Ferguson's new high power MF 8400 Series, with four new models ranging from 215-290hp, is designed specifically to provide the highest levels of performance and productivity necessary to achieve the huge work-rates that are now vital for economic operation in critical times of intense fieldwork. Equipped to the highest specification, the new tractors are ideally suited to modern large-scale farms and contractors. 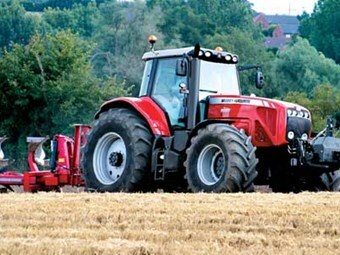 Massey's MF 8400's top features also include powerful and economical Sisu Diesel engines, an electronic linkage control system offering accurate, sensitive operation, and superb cab comfort with noise levels of just 71dB(A), with Dual Stage suspension and excellent ergonomics to reduce operator fatigue. A new GTA console and Datatronic III terminal provides ultimate control and automatic headland control memory, spool valve management and work displays. 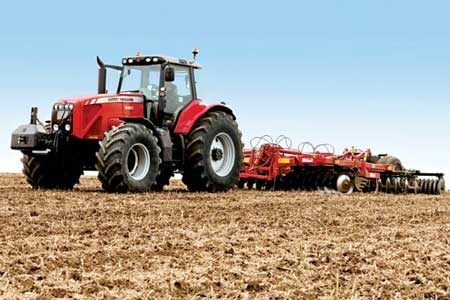 Massey Ferguson's continuously variable (CVT) Dyna-VT transmission is standard on all models. This allows operators to select any combination of engine speed and forward speed to optimise output and the work quality. Engine revs can be set for the precise combination of power and torque required for the best work quality, resulting in optimum fuel economy and lower noise. A range of automatic functions and operating modes further enhance and simplify handling, providing high outputs with the best working quality. The transmission also enables the engine to work at minimum required engine speed for most economical operation. A 150 litre/min, closed-centre, load-sensing (CCLS) hydraulic system is standard on all MF 8400 Series tractors. Providing lift capacities of 10,500kg across the range, the efficient CCLS pump supplies pressure and flow only on demand, reducing losses and improving economy. Massey Ferguson's renowned ELC Electronic Linkage Control, with its class-leading accuracy and straightforward operation, provides precise draft, position and intermix functions. Standard radar allows the system to compute wheelslip accurately, providing extra precision and control. Further sophistication includes rate of drop, "quick soil engagement" and Active Transport Control suspension for mounted implements. Spool Valve Management System (SMS) and Integrated Tractor Control System are standard. The new MF 8400 Series models come with the option of MF's entirely new GTA console colour terminal and control system. This system builds on the success of Datatronic by providing unprecedented levels of control and automation. 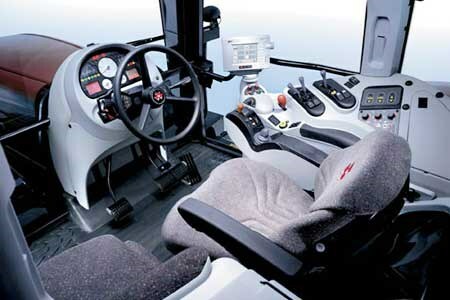 Inside the cab, the working display screen shows information on the operation of the tractor. The display provides engine speed information and also enables the operator to select two displays simultaneously. Information can be selected on the spool valves, gearbox, memories and headland management. The flow and timing to the spool valves can be adjusted and stored using the new terminal. These are then replayed at the flick of a switch or in the headland program. Six complete sets of different information corresponding to driver, implement or fields can be stored, helping to reduce paperwork and aid record keeping. Settings provide for the adjustment and setting of the terminal itself - for example, the language, type of units displayed, brightness of screen, etc, and a "Dual Control" system enables the setting and adjustment of Front and Rear Dual Control and Trailed Implement Control. A "headland" setting enables the driver to memorise the functions, which he operates at the headland, and then replay them automatically at the push of a button when turning at the headland. For more information contact your local Massey Ferguson dealer. Massey Ferguson's 8480 (290hp) Dyna-VT model is the latest in the company's lineup to receive international praise. At the EIMA Show in Italy in November last year, it won the prestigious Tractor of the Year Award - 2005. The award was the result of the MF8480 topping a poll of judges consisting of many of Europe's leading agricultural journalists, who judged performance-related aspects of the tractor that would be most important to an owner. "Since joining AGCO I have been impressed by the new ranges of tractors that Massey Ferguson now has to offer to customers of all types," said Martin Richenhagen, AGCO's president and chief executive officer. "The MF 8480 is a superb illustration of Massey Ferguson's commitment to producing exciting new products that all feature high-calibre, innovative engineering. 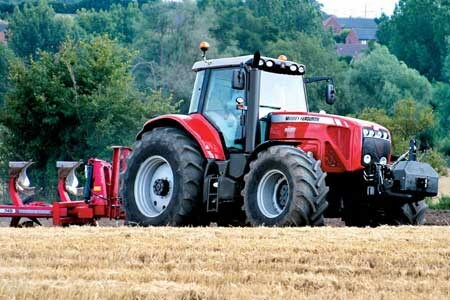 The quality, performance and reliability of the total new range of MF tractors is truly representative of a global brand." Over the last 18 months, Massey Ferguson has completely replaced its product line with new tractors in every horsepower category. The MF 8400 Series is designed specifically to produce the huge outputs needed for economic operation in intensive fieldwork. At 290hp rated, 315hp maximum power, the MF 8480 is the most powerful in a four-model range.